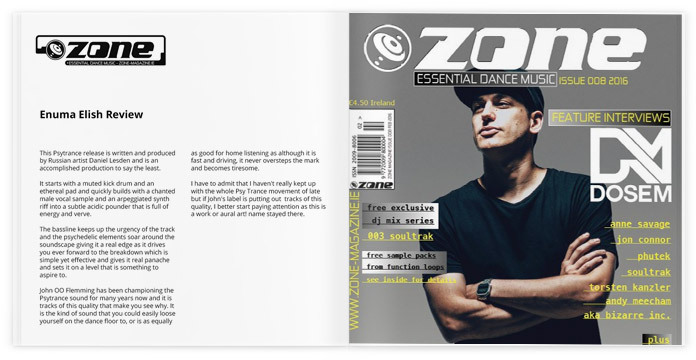 Zone Magazine is an Irish magazine about underground dance music scene, born in 1994. On February 2016 issue #8, staff journalist Danny Slade reviewed Daniel’s Enuma Elish, recently released on JOOF Recordings. This Psytrance release is written and produced by Russian artist Daniel Lesden and is an accomplished production to say the least. It starts with a muted kick drum and an ethereal pad and quickly builds with a chanted male vocal sample and an arpeggiated synth riff into a subtle acidic pounder that is full of energy and verve. The bassline keeps up the urgency of the track and the psychedelic elements soar around the soundscape giving it a real edge as it drives you ever forward to the breakdown which is simple yet effective and gives it real panache and sets it on a level that is something to aspire to. John 00 Flemming has been championing the Psytrance sound for many years now and it is tracks of this quality that make you see why. It is the kind of sound that you could easily loose yourself on the dance floor to, or is as equally as good for home listening as although it is fast and driving, it never oversteps the mark and becomes tiresome. I have to admit that I haven’t really kept up with the whole Psy Trance movement of late but if John’s label is putting out tracks of this quality, I better start paying attention as this is a work of art!